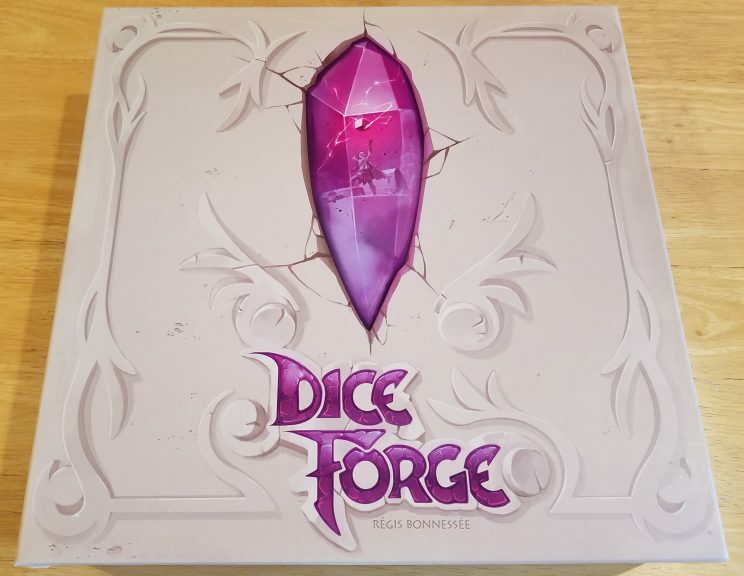 Designed by Régis Bonnesseé and published by Libellud, Dice Forge is a “resource engine” game that incorporates the luck of dice. As with other resource engine style games, your goal is to invest in your own ability to generate gold, shards, or victory points. How Dice Forge differs from the others is in how you invest in your own engine. Splendor is probably the simplest example of this: players invest in gem mines, which then generate permanent income each turn that can be used to purchase more expensive gem mines. Games like Terraforming Mars require you to invest in cards on your tableau which improve your income or resources. Other games, like Trains or Orléans, require you to invest in additional resources that are drawn on your turn and are then played strategically or tactically to give you an advantage. Dice Forge does the same thing through direct upgrades to the dice themselves. Each die in the game comes with removable faces. Players then utilize gold to invest in different faces to personalize their engine depending on their strategy. Yes, there are random elements, as you cannot control which face of the die will turn up each time you roll, but you at least have some control over what is on the dice themselves, thereby improving your chances. You have entered the realm of the gods, but only the mightiest of you can ascend to the role of demigod. You have a limited amount of time to demonstrate your worth through your deeds and actions. 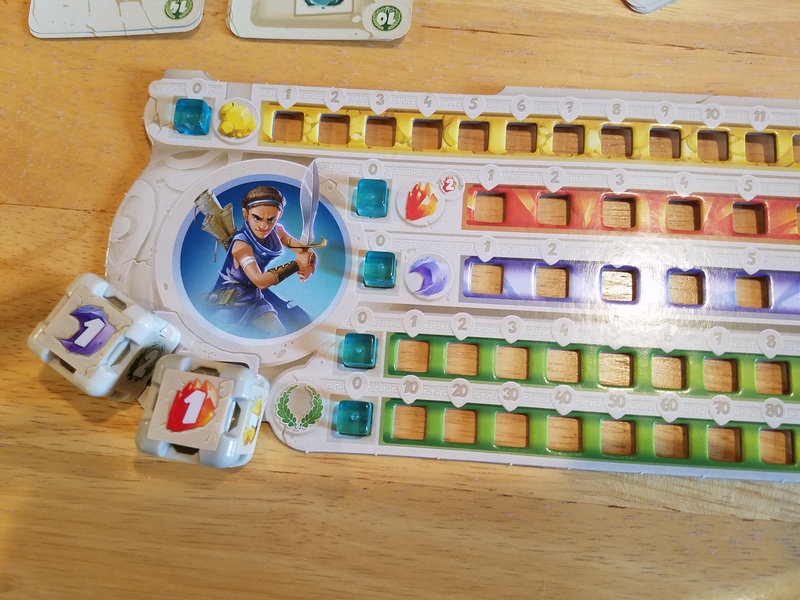 The fantasy theme makes sense with the type of game that Dice Forge is, but as with most board game themes, it is just window dressing for the mechanic. The art style of Biboun is very striking. Almost everyone who has played Dice Forge with me has commented on how unique and appealing the art is in this game. The entire board set-up flows together well. 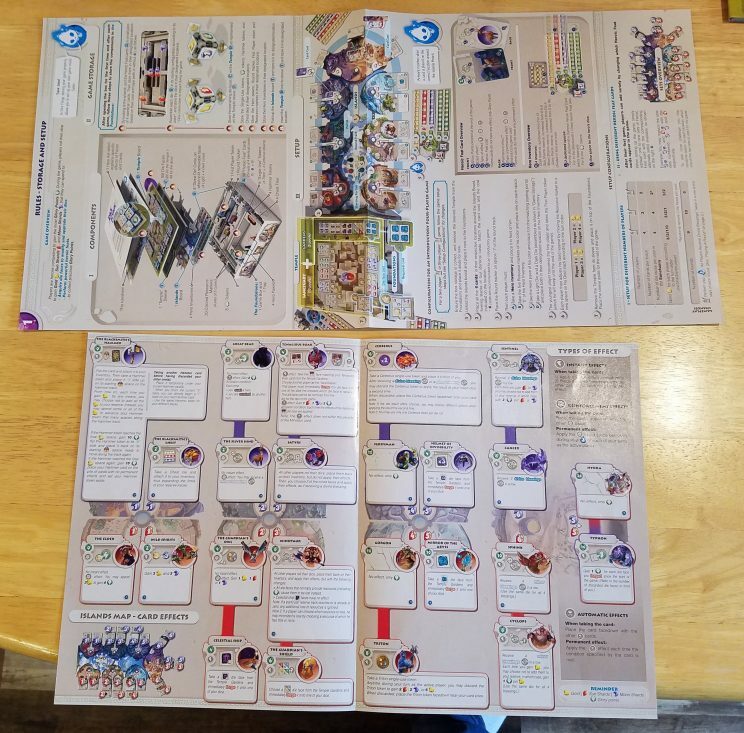 In addition, the rules and player aid are full-color and include explanations of every single die-face upgrade for clarity. 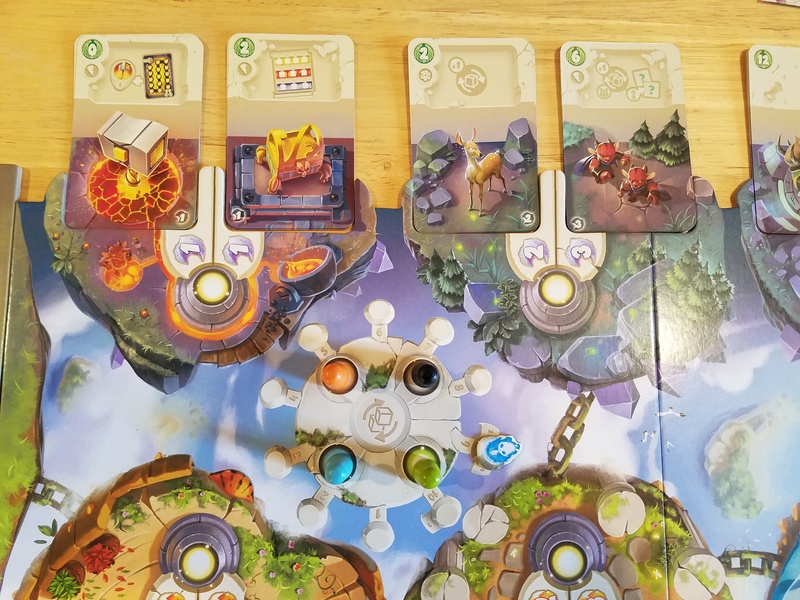 The really cool thing is that the Temple (the repository for all of the die faces that are available for upgrade) aligns perfectly with the Islands (the playing board) and the art on the Islands matches perfectly with the heroic feat cards selected for play. The player aid describes each of the heroic feats and die faces for easy reference. This aid even clarifies special die face interactions to eliminate any loopholes or misunderstandings in how they interact. The rules are full-color and easy to understand. There is even an example of a typical turn that clarifies purchasing identical die faces at the Temple on a single turn (spoiler, you can’t). Lastly, the players’ resource boards are punched cardboard with slots for the available resources. This is perfect for the game, since the slots hold the tokens in place securely and, in my opinion, is something that Terraforming Mars should have provided instead of their flat player mats since they use an identical method for tracking their resources. The production value in Dice Forge is high. Everything nests well with the custom insert and there’s even room for future expansions, should any ever be offered. The player mats are high-quality punched cardboard so a light knock when reaching for a drink won’t send your resource markers skidding across the table. 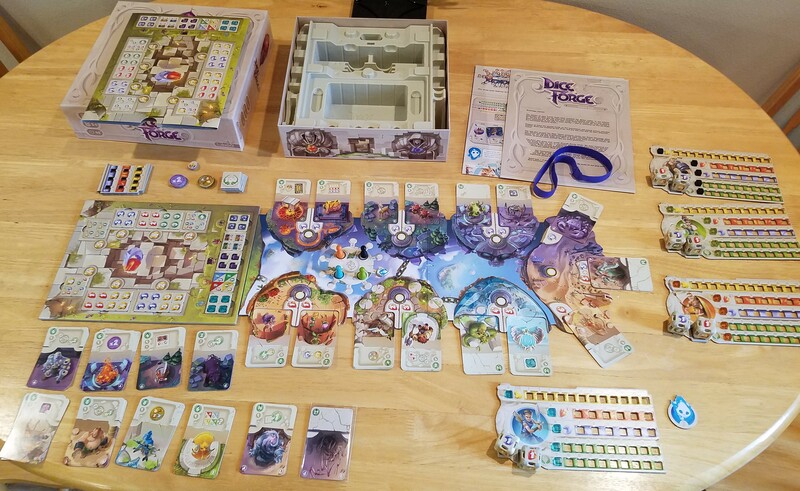 Setup for Dice Forge is easy for 4 players, less so for fewer players. For 4 players, decide whether you’re playing with the starting heroic feats (these are marked with a blue dot on the back of the card) or the advanced feats. Once decided, remove the Temple from its sleeve carefully and align it with the Islands board. Then distribute the heroic feat cards based on their cost (the artwork helps to figure out where they go). Then place the player pawns in the starting area. Each player gets a mat with five colored marker cubes set at 0 and a pair of identical dice: one with a single sun shard face (red) and five 1-gold faces (yellow) and the other with a single moon shard face (blue), a single 1-point face (green), and four 1-gold faces (yellow). The starting player (youngest) gets the 1st player marker and will keep it until the end of the game. 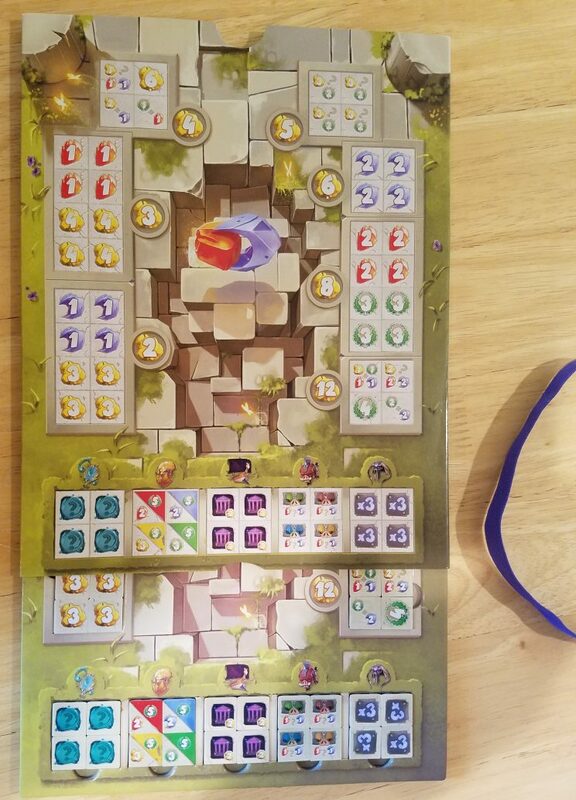 The first player then gains 3 gold, the second player gains 2 gold, the third player gains 1 gold, and the fourth player starts at 0 gold. The round token is placed on the 9 that surrounds the player pawn starting area on the Islands board. 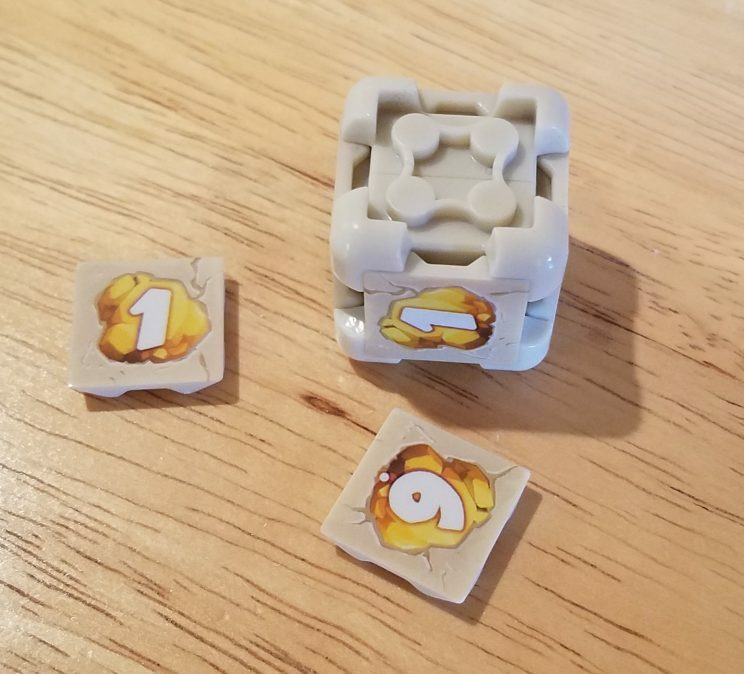 The game rules suggest leaving many of the tokens in Foundation (the box) and set the Temple (the die face tray) inside for game play, but the box is pretty deep, so it can make seeing other players difficult. I prefer to pull the Temple out and set it up as displayed. Setup for games with fewer than 4 players is identical with the following exceptions: (1) when putting out the heroic feats, place a number of cards identical to the number of players in the game; (2) set the turn marker to the appropriate place for the number of players; and (3) remove die faces from the Temple based on the number of players (i.e., there should only be 2 heroic feats of each kind and 2 identical die faces for each monetary value for a 2 player game and the turn marker starts at 9). Removing the extra heroic feat cards is easy, but removing the die faces is a serious pain and makes clean-up a chore. In the 2 player games I have done, we have simplified this by stating that once 2 faces are sold out of a given Temple pool, the others are unavailable for purchase. 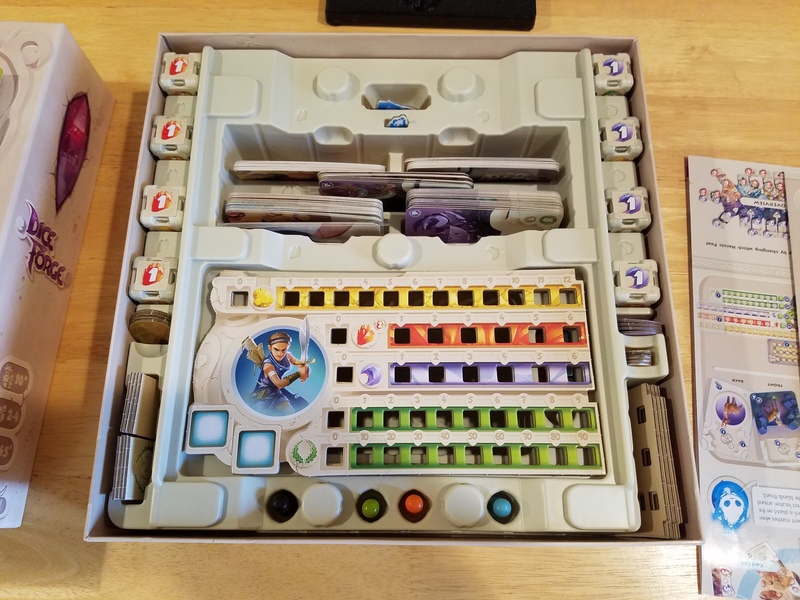 Dice Forge scratches a special itch for those of us that like organization in our games. The custom insert is top notch and everything fits in a space. Only one thing to note: be careful to put the turn token in its appropriate slot, because it is difficult to get out of some of the deeper slots for other pieces. The basic rules are simple. Everyone rolls their dice and gains resources during everyone’s turn, but the player whose turn it is then gets to pick one of two actions. They can purchase one or more die faces from the Temple and immediately place them into the position of their choice on their dice or they can pay the appropriate sun or moon shard cost and complete a heroic feat. The active player may once per turn spend 2 sun shards to complete a second action on their turn. This second action can be either another die purchase (although it probably won’t be, which we’ll get into in a second) or complete a heroic feat. Once their action (or actions, if spending the shards) are complete, the next player becomes the active player, everyone rolls and gains the resources, and play continues. Purchasing at the Temple isn’t always straightforward. You are not allowed to purchase more than one of the same die face on your turn. For example, you could buy a 2-sun shard face and a 1-sun shard face, but not two 2-sun shard faces on the same turn. If you wanted to buy two identical faces, you could spend 2 sun shards and take an extra action on your turn to do this, but because that is unusual and you’re allowed to spend all of your money at the Temple each time you go, spending an extra action to make a second purchase is rare. Usually players will use that extra action to complete 2 heroic feats or 1 feat and 1 purchase on their turn. The Temple is divided into two sections. The Sanctuary includes all of the die face sections with an associated gold cost. The Gardens is the cluster of 5 die face pools without a gold cost and can only be obtained by completing the appropriate heroic feat. Note that 3 of these pools of die faces will not be available when playing with the starting feats. Performing heroic feats also carries a board control element. You move your pawn to the location appropriate to complete the heroic feat, spend the shards (moon or sun or a combination), complete the feat and gain whatever boon (if applicable), and then leave your pawn there until the next time you complete a feat. Your pawn does not prevent other players from completing those feats, but if they “oust” you back to the starting area, you get to roll your dice and gain the resources. Therefore, it is valuable to try to position yourself in locations that other players will value so that you can earn additional resources, but because you cannot move to a location without completing a feat, it’s not easy to park your pawn in a location and leave it there. Additionally, one of the advanced heroic feat cards allows you to gain resources from ousting other players, so that can play into it as well. To complete the Blacksmith’s Hammer or the Blacksmith’s Chest heroic feats, a player will move their pawn to occupy the space between the two. Another player wishing to complete one of those feats will oust the player already there, returning them to the center of the board and granting them additional resources by letting them re-roll their dice. There are three types of heroic feats that a player can complete. The first award points at the end of the game and they’re the simplest, because they provide no additional boon. These are differentiated by the lack of emblem at the top of the card. The second provide points and an instant boon. These are identified by the lightning symbol on the card. When a player completes a heroic feat with an instant boon, they immediately gain the resources, points, or tokens described by that boon. Last, there are heroic feats that reward players with ongoing assistance. These cards are identified by a gear symbol and do not provide an immediate effect and sometimes don’t even provide points. Players may call upon assistance from these permanent effect cards once per turn while they are the active player (and not at all when gaining resources on another player’s turn). There are no limits to how many heroic boons of the same type that a single player may own, but unlike purchasing at the Temple (where players can buy as many die faces as they would like with the money they have available), only a single heroic feat can be completed on your turn (unless you spend 2 sun shards to take a second action). These are the advanced heroic feat cards and combine with some of the basic feat cards for an advanced game. None of the advanced cards give only points. In this photo, the Tenacious Boar, Cerberus, Sentinel, Celestial Ship, Guardian’s Shield, Triton, and Cyclops cards all give instantaneous boons. Only the Great Bear in this example gives a permanent boon to a player. Once all players have had an opportunity as active player and the person holding the 1st player token becomes active player again, the turn counter token is moved down. When it reaches 1 and all players have gone on that round, the game is over. Players then sum up the point values on the heroic feats with the points collected directly from their dice and whoever has the most points wins. Congratulations on your demigodhood! 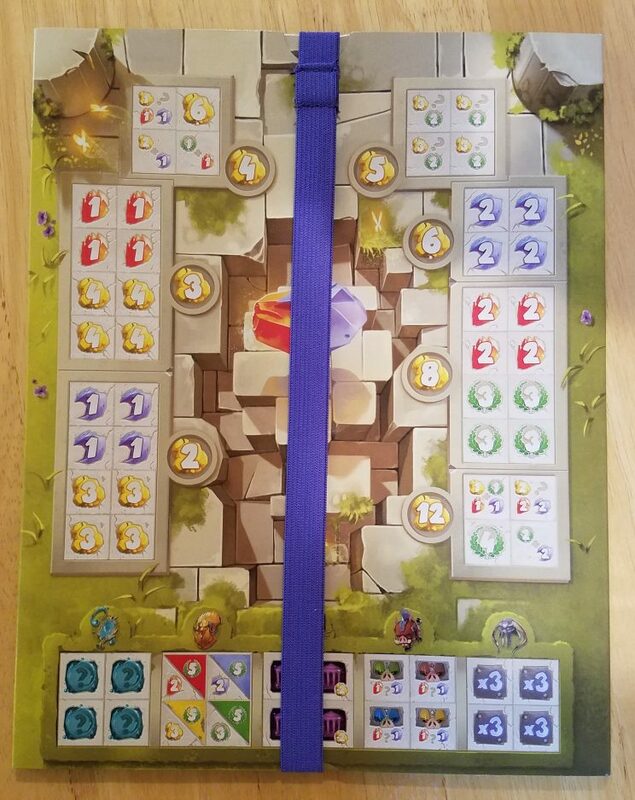 Dice Forge plays out of a finite set of turns with all players having the same number of opportunities as active player; however, because of the board control aspects and the heroic feats available, not all of the players will experience the same resource gain or get to roll their dice the same number of times. Therefore, Dice Forge is an optimization game, right? Just keep building your dice the way you want them and eventually you’ll win the game. Except that if you spend all of your actions on optimizing your dice, you’ll miss out on the heroic feats and the boons that they can bring, as well as additional resource gains from being ousted from a key position on the board. I should know, I made this mistake the first time I played and I lost horribly. The die faces pop off easily if you tuck a corner into the slot and pry gently. If you don’t want the faces to fly off into the oblivion, put a finger over it to keep it in place until it is unseated. There is a delicate balance to Dice Forge and, so far, I haven’t found a clear path to victory. One game, intense gold income combined with the Blacksmith’s Hammer feat (which allows the limited conversion of gold to points) was what won the game. Another time, liberal sun shard income with the ability to take a second action nearly every turn granted victory. This speaks well of Dice Forge’s gameplay design. The random element of the dice rolls can derail the “perfect” strategy in a heartbeat, so players have to remain flexible in how they want to approach the problem of maximizing their income and their points. 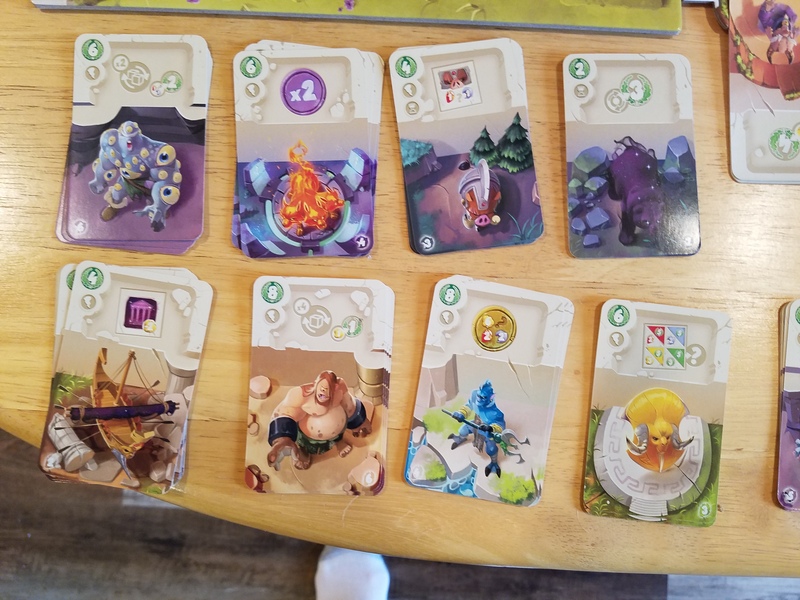 Other games have implemented random elements to their income and allow multiple players to gain resources on a turn, but none of the ones I have played are as refined as Dice Forge. Catan uses a dice roll to determine which hexes generate resources for the players adjacent to those cities, regardless of whose turn it is. Machi Koro has establishment cards that allow income on an opponents turn (sometimes to their detriment). 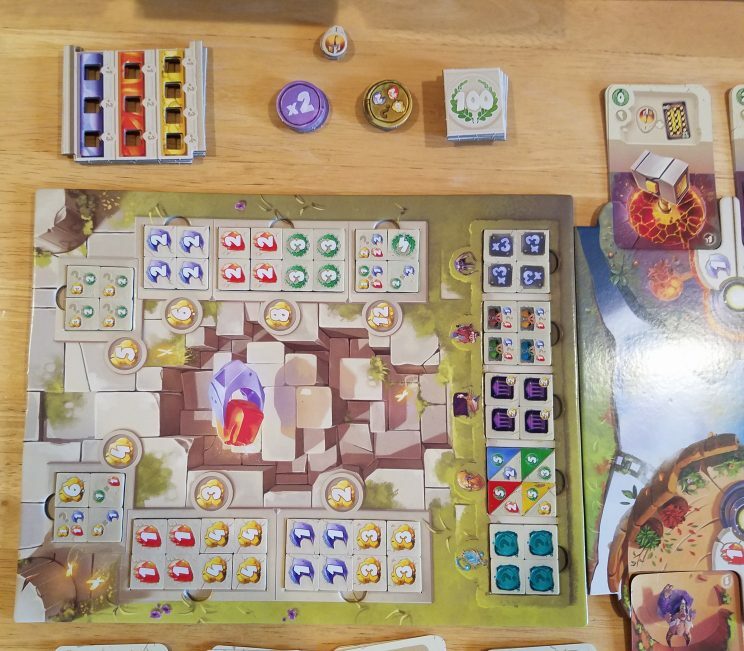 What these games have in common is that often, a dice roll results in nothing for the player (let me tell you about the game of Machi Koro from hell sometime). Dice Forge is never like that; you always get some minimum of resource income on a dice roll because they’re your dice! Sure, there are ways to optimize them and improve them that are arguably better than others (note, since sun shards allow extra actions, improving your sun shard income is always a priority), but at least there are no turns in which nothing happens to your benefit at all. Remember when I said build quality was high? The Temple is stored in a cardboard sleeve that prevents the die faces from coming loose and rattling around during transport. Dice Forge even comes with a stretchy fabric band to wrap over the Temple and its sleeve for transport. One other stellar game play mechanic is the addition of the advanced heroic feat cards. In an advanced game, there are no heroic feats that give points only; every feat grants a boon. And some of them are really neat. For example, the Tenacious Boar allows you to give the boar die face corresponding to the feat purchased to an opposing player. That player must then forge it onto one of their die permanently (cannot be replaced in the game). Each time they roll that face, they get resources equal to what is shown, but so do you! Don’t want to spend an early turn purchasing at the Temple? Spend 2 sun shards on the Celestial Ship feat, which allows you to forge a celestial ship die face onto one of your die. When that face rolls up, you may purchase immediately from the Temple for a discount of 2 gold without using an action to purchase that turn. The advanced game has some really neat mechanics that seem like they might be a little fiddly, but because of the excellent full-color player aid, figuring out exactly what a feat or die face does is super easy. Dice Forge plays fast for groups that know the tiles, which means that several games can be played in a single sitting without too much difficulty. I played three 2 player games with a neighbor on New Years Eve in about 45 minutes, and that included a rule explanation for the first game. Four player games can last 30 minutes to complete, but even that is pretty short for a board game these days. This speed, combined with the art style, build quality of the components, and the dice upgrade mechanic, scratches an itch for me that none of the other games quite get to. There is enough randomness to make each game unique and fun, but the game mechanics ensure that all players are continuously engaged in a way that other resource engine games don’t. To top it off, it runs cheaper than many other board games, especially for one released as recently as Dice Forge was. Base retail is $39.99 on Amazon. At that price, I recommend Dice Forge as a good addition to anyone’s board game collection. If you’re interested, but want to check out the rules for yourself, Libellud has the player aid and rules for download on PDF on their website, but Asmodee has a better example of the art style and description on theirs.